I'm running back home again tomorrow for the funeral of yet another aunt. I didn't know her as well as I did my Aunt Mollye, unfortunately; but her passing leaves my dad as the last one standing of his cohort - out of 3 brothers and their wives, 5 are now gone. It's strange, realizing that the memories the 6 of them shared - memories of growing up during the depression, fighting in the Second World War, raising their families during the post-war boom and the subsequent turmoil of the 60's and 70's - are being snuffed out, as if they had never even happened. And I think of myself and my friends, immersed in our busy lives of child-rearing and jobs and social events, and imagine all that, too, someday slowly disappearing, barely or not at all remembered by our kids. That's one of the saddest things about a death - all the stories that die with that person, all the events and experiences the deceased can no longer bear witness to. On the other hand, it's a Jewish funeral; so the food will be awesome. We're good at that. Susie (my youngest, she of toilet-paper-replacement fame) has just learned to read. Oh, she's been laboriously sounding out short-vowel sounds and trying to recall sight words for a while now; but today was that watershed moment when she turned around (she had been doing a math drill at the computer) and said, pointing at the words that had appeared on the screen, "Mommy, I can READ that." Oh, people, I swear to you, angels sang at that moment. For the past 4 years, Susie has been the only non-reader in our family -- or, in other words, the only person with NOTHING TO DO when all her siblings had settled down for a quiet hour or so of reading. Do you know what this means? Can you even begin to understand? It means that, after 21 years, no one will ever again be BORED in this house. It means that I will no longer be asked to entertain anyone. It means (oh, can it possibly be true?) that I will NEVER have to read Curious George again. Commenters on Tuesday's blog post were overwhelmingly in favor of my opening the expired sweepstakes bag of peanut M&M's. They all agreed on the two rationales of "You have to know if you would have won" and "It's chocolate! Don't waste the chocolate!" So, with the children gathered around me (see above, re "chocolate"), I ripped open the bag. Would the contents all be brown? Had I truly missed out on $100,000? As you can see from the picture above, no, I hadn't. And, unfortunately, peanut M&M's do not hold up well to the ravages of time. Quite stale, they were. Alas. But at least I do not have to lie on my (hopefully far-in-the-future) deathbed and wonder what was in that darn bag. I wouldn't want to have a hospice nurse telling my grieving loved ones that they were not uppermost in my mind during my last hours here in these temporal realms. We have a problem here. You see, sometime last year I bought a very large bag of peanut M&M's. Wanting to make sure they didn't "disappear" before Bunko night, I hid them in my bedroom. Naturally, when Bunko night rolled around, I couldn't find them; so I bought another bag to share with my guests. Fast forward to this morning, when I found the missing bag of peanut M&M's in my closet, hidden under a sweatshirt. That's good, right? 2 pounds of melt-in-your-mouth-and-not-in-your-hand goodness, and they were mine. ALL MINE. 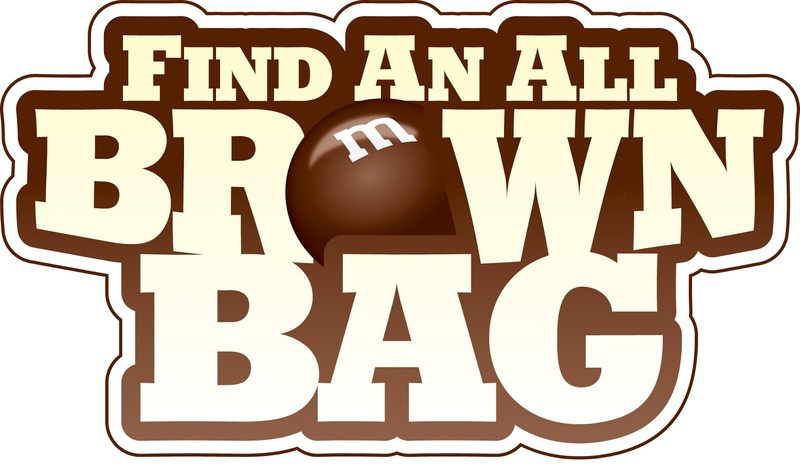 But wait - on the bag it said, Find An All Brown Bag and you could Win $100,000 Instantly! Well, that's nice. I mean, I could use some money. Except, as it turns out, the sweepstakes ended last September. 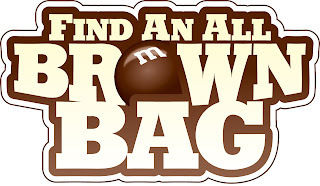 So here is my dilemma: do I open the bag of peanut M&M's, thereby risking the discovery that it contains only brown M&M's? Do I really want to find out that, for the past year, I've had $100,000 lurking in my closet, $100,000 that has now turned into a pumpkin, as it were? Or do I just throw out the unopened bag and NEVER KNOW? Opinions in this household differ, so we're putting it to a vote here on the blog. To see, or not to see? That is the question. My day? I spent it hiking through a national park with a friend celebrating her birthday week. Yes, she IS taking a whole week, because she's turning 50 this year. Then we went out to lunch with another friend. 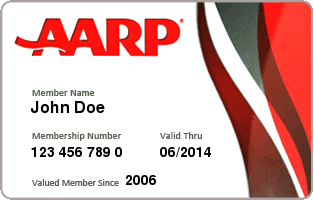 I was doing fine until the birthday girl showed off her brand new AARP card. 4 months, people - that will be yours truly in just 4 more months. 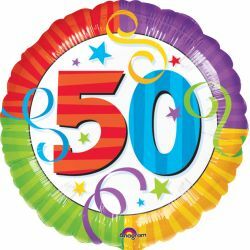 So I'm taking suggestions - how should I celebrate my impending 50th? Nothing is too unreasonable, but keep in mind that I have never been the type to enjoy male strippers. Hey, folks, I'm over at Derfwad Manor today, being featured on Slow Cook Thursdays. Pop by if you'd like to read about how I am a one-secret-boyfriend kind of gal, unlike that trollop Mrs. G.
Shouting "Wake up, campers, it's GROUNDHOG DAY" every morning. Granted, if they would just roll themselves out of bed faster, they wouldn't have to hear it. Repeating ad nauseam "The Internet is NOT PRIVATE, dammit." Spending an unreasonable portion of 2012 watching Call Me Maybe videos -- time that, admittedly, could have been more gainfully employed cooking healthy meals and cleaning the house. Sorry, kids, great art can't wait. Telling them that the world is a safe, happy place. I lied. In my defense, it was easy to get away with that sort of thing back then, with no real Internet available. All I had to do was keep the TV off. Making them eat baby carrots with almost every meal, because I'm too lazy to prepare other vegetables (and too busy watching "Call Me Maybe" videos). 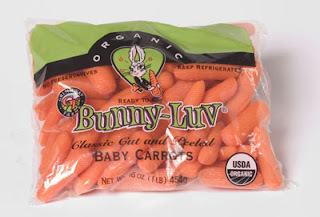 I'm sure, 20 years from now, we will find out that baby carrots are bad for us. My grandchildren will probably have 9 heads. Each. So tell me, readers, how have you ruined your children's lives? Spill it. I was going to wait and post tomorrow; but now it seems as if I have some sort of food poisoning thing going on, and I'm not sure I'll live that long. We had a spectacularly ordinary weekend around here - driving kids places, doing our monthly commissary run, watching Larry paint primer on yet another set of newly insulated walls. Excitement, apparently, has no place in our solidly suburban lifestyle, people. Now that our baby-raising days are over, we find ourselves smack in the middle of the carpool/music lessons/teen years, which are - shall we say - not replete with hilarious tales of vomited-on parents and barf-spewing kids. Well, I guess that's probably a good thing, right? But, you see, the problem is that no one does anything cute around here anymore. I swear, we used to spend hours watching our 2-year-olds cavort around the living room. Even mealtimes are less fun, because there's no one spitting out food to make everybody laugh. Is this how everyone without babies lives? What do you people do to amuse yourselves? Also, I'm on the verge of being unemployed. Have I mentioned that? It's good timing, actually, since I'm turning fifty in a few months; so now I will have plenty of time on my hands to start a full-blown midlife crisis. Go back to work full time (that is, if I can even find a job)? Run away from home and join an ashram? Start life over as a barista in Seattle? The variety of options is almost overwhelming. Every once in a while, a child will do something that makes all those years of parenting (21, but who's counting?) worth it. Something that makes you realize that, hey, there is hope that one of those little people who have been cluttering up your house for well nigh 2 decades might actually turn into a bona fide grown-up someday. And this past week, dear readers, just such an event took place in my household. You see, a child -- one born of my loins and suckled at my breast -- spotted an empty toilet-paper spindle and, of her own accord, retrieved a roll of toilet paper from the linen closet and PLACED THAT NEW ROLL ON THE EMPTY SPINDLE. Not to name names, but it was Susie, the 7-year-old, who has earned Most Favored Child status for the foreseeable future. 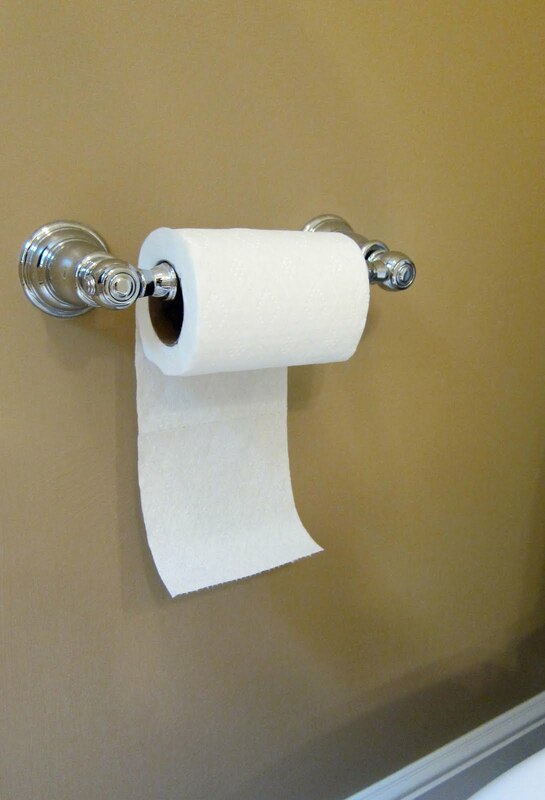 And every time I walk into the powder room and see that clumsily loaded roll of paper hanging there, I -- no joke here -- get tears in my eyes and a funny little pang in my chest. So, that flu-like virus I had Saturday was mercifully short-lived. 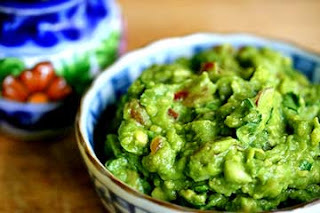 In fact, it departed just in time for me to come down with something else -- some virus that kept me up last night feeling as though I was going to have to revisit all that guacamole I had downed at a neighbor's Super Bowl party. The bright side is that this should be very helpful in my latest weight-loss endeavors. So Larry had to come home from work yet again to find me lying on the couch, looking like hell. And the house looks even worse. Luckily, my teen knows how to cook. I'll give myself a pat on the back for that, at least. Tell me - why is it that other folks always come up with the funniest lines? I've been laid low with yet another of the myriad winter viruses that are visiting our household this year. So I spent the evening at a friend's house, catching up on Downton Abbey while ingesting hot-and-sour soup from the local Chinese restaurant. And drinking numerous cups of tea. Just what the doctor ordered. I've been trying to finish The New Kings of Non-Fiction, but I keep falling asleep (see above, re "virus"). The book giveaway is officially postponed. I was supposed to get to the commissary tomorrow to stock up on necessary items like mayonnaise (Brian) and toilet paper (everyone), but that's being put on hold, too. Oh, and I'm unemployed, as of April. Anyone have any extra jobs lying around? 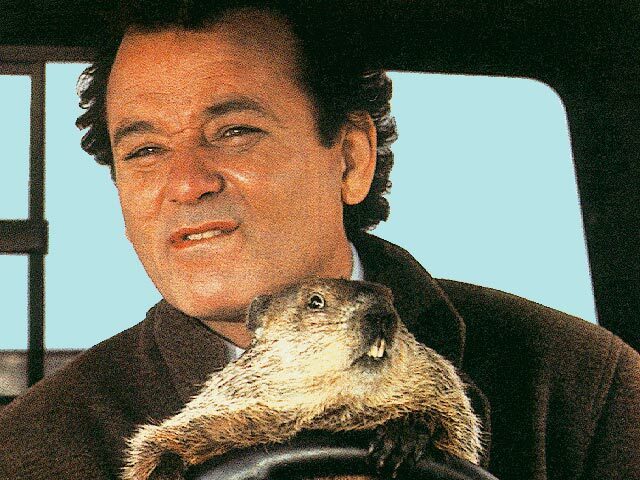 So, yeah, Happy February! 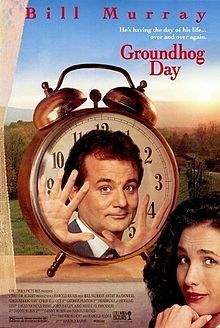 On the bright side, last night we introduced Brian to the film Groundhog Day. That's an important rite of passage in this house, you know. Next up, Ghostbusters. It's getting sort of difficult typing this while laying my head down on the desk. I think I'll have some more tea and go to bed. Night, all!